This is a wonderful Baroque gold and jeweled pendant, dating to the early 17th century. 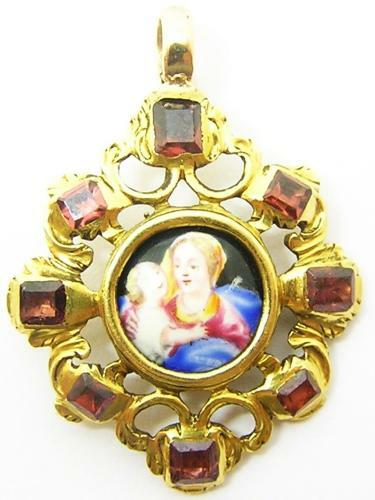 It is set with a French Limoges enamel plaque of the Virgin Mary, with a scalloped bezel. It is possible this plaque is a later addition to the pendant which appears much earlier. The frame is adorned with eight table cut rubies, in tightly rubbed settings. The suspension loop appears to be a later replacement, possibly c. 1680 when the enamel was set. The main jewel would date to c. 1600 - 1650.